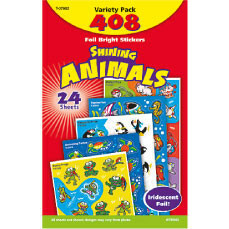 Delight kids of all ages with these super shiny animal stickers. The colourful, fun designs include frogs, turtles, penguins, fish, seahorses, and pigs! Great as a quick reward, kids will be on their best behaviour to collect them all! Sticker size and shapes vary from large to small.